Named after a type of curve in an F1 track, these two constant radius corners are magnified in a separate details poster to hi-light the two stops of the hero's path that FLUSH/FLOOD oscillates between. 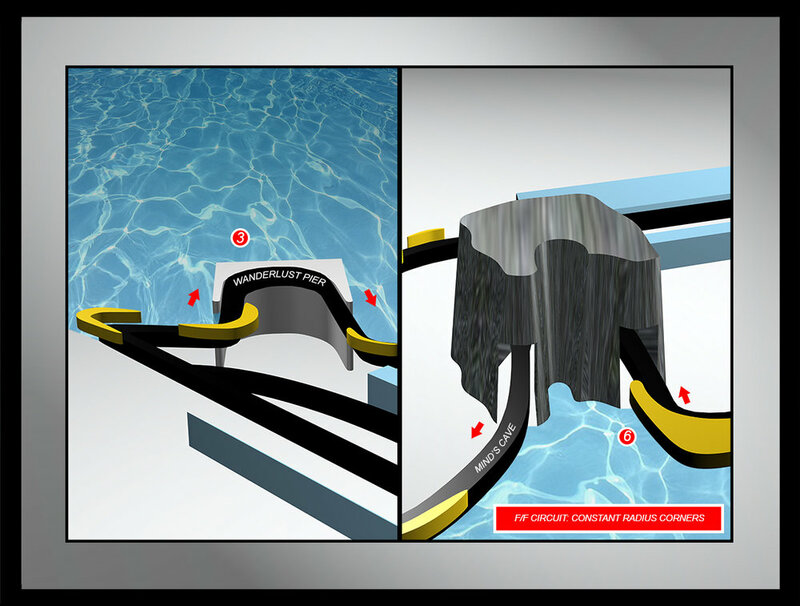 As the driver goes around and around the track continuously, they hug the curves that geographically represent a pier and a cave. Opposite in their exterior/interior nature— the pier is a place from which to look out at the sea to the great beyond, while the cave is a space of natural deprivation, where one can be left alone with their thoughts. The F/F Circuit puts a visual to the mental meditative space of the racecar driver.